If you haven't visited the Simple Truths site, then you are missing some wonderful, mini-motivational movies. 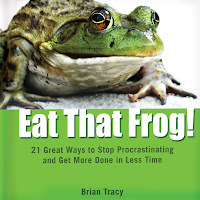 I've watched several of the movies numerous times: Walk the Talk and Eat That Frog, and Finding Joy are some of my favorites. Most movies are less than five minutes, but offer wisdom that will impact your day. If you only have time to watch one mini movie, watch To a Child LOVE is Spelled T-I-M-E, but make sure you have a tissue handy. Scroll down to the bottom of the list of movies. 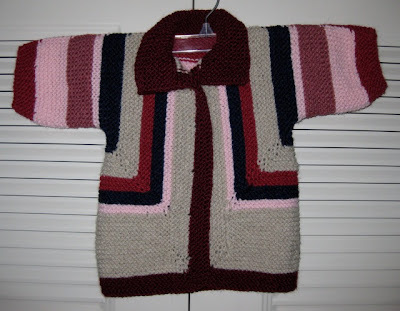 Last month, I sent baby blankets that I had knit during the winter to the coordinator of the West Coast Oddball Knitters, and today she posted pictures on the group blog. I had to chuckle when I saw my new title, Wonder Woman of Blanket Knitting. 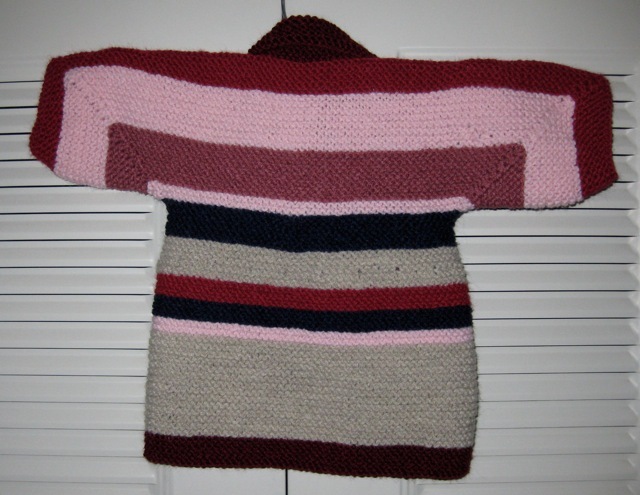 I think it means that I sometimes "wonder" what I am going to knit next. Hokey Pokey, a West Coast Oddball Baby Blanket, is being knit on size 8 needles. 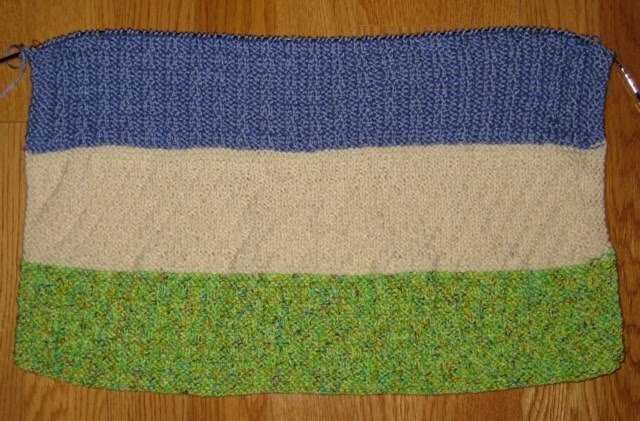 I really like how this one looks: it should be a fun blanket for a little one! 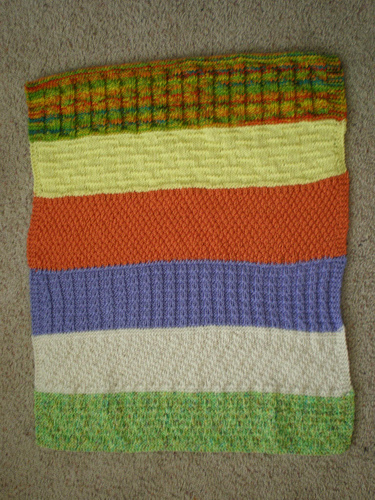 Hokey Pokey is now ready for its border. 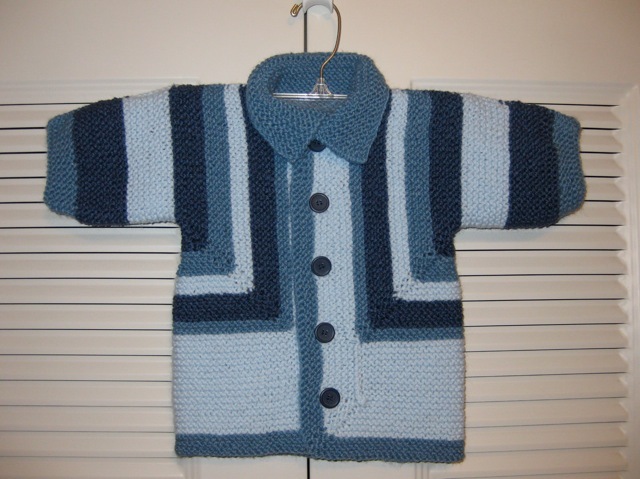 Sometimes it is difficult to part with the items that I knit, but I know these sweaters are needed at the Ukrainian orphanage more than they are at my house. I had such fun making these little sweaters and wanted to give you one last look before I boxed them for mailing to Father's House International. Over the last two weeks, I have gained a new respect for anyone who has Shingles. I thought that I was tough and could handle pain until I met this foe. I could almost hear the chuckles from the spreading rash and the nearly debilitating ache in my hip. 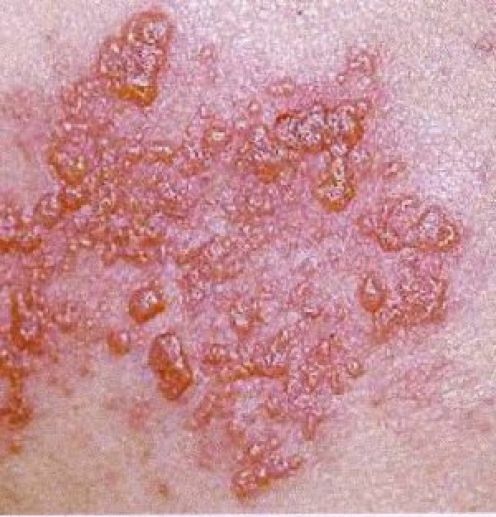 I was unaware that Shingles could cause joint pain, but it DOES! The ache and pain in my right hip felt like it was right to the very bone, and even minor movement caused extreme discomfort. Thankfully, my doctor prescribed an antiviral after I saw him on Monday, and by Wednesday morning I could walk without hobbling like an ancient person. For a week, I'll gladly take the HUGE pills three times a day if it means I can walk, sit, or even lay down without pain. The photo was captured online: trust me, you would not want to see my rash even if I could get a photo without turning myself into a pretzel. Several years ago, I tried to get a Shingles Vaccine but was denied because I was not over 60. When I qualify, the vaccination will be a gift to myself. Yes, I am a wimp, and I have great RESPECT for this disease. A Little Help From My Friends. . .
Another online buddy, Bonnie of In Stitches with Bonnie sent me a box of scrap yarn last week. 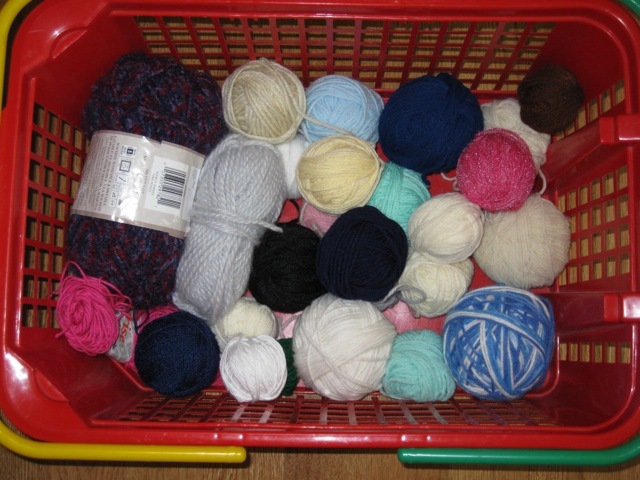 She wanted to find a home for these oddballs of yarn since she is moving. I am grateful that with the help of my friends that I can continue to knit items for various charities. Thanks, Bonnie! 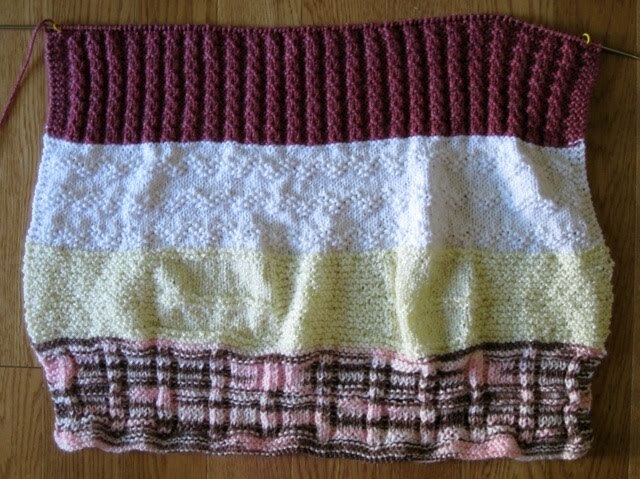 Banana Split, a West Coast Oddball baby blanket, is being knit on size 6 needles, so it will be a preemie blanket. 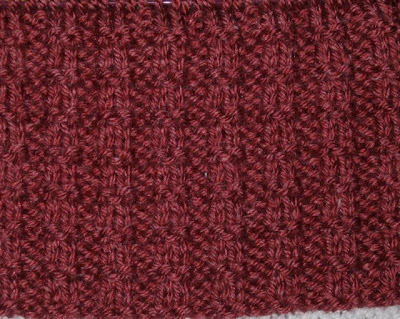 I used Simply Soft (Cranberry) and an adapted Grill Stitch for my section. 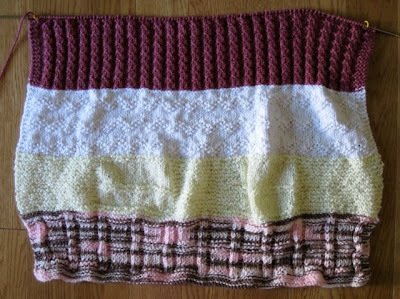 I hope the border will resolve the tension problem this little blanket seems to have. I think it is due in part to different weights of yarn as well as the tension of some sections. Last week, another box arrived from Rena G. in Virginia, and as I opened it, I was overcome with delight, unbelief, and tears of joy. 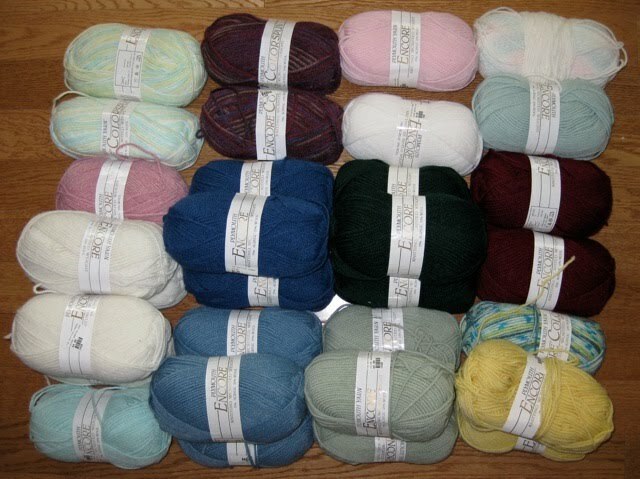 Thanks to Rena, I will be able to keep knitting for charity for quite a while. My limited budget certainly would not allow me to splurge on so much luscious yarn, so I am grateful for Rena's generosity. 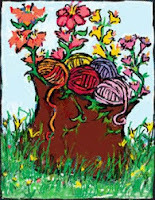 Thank you, Rena; I am overwhelmed by your gift of friendship and yarn. I am using the smallest balls of Rena's scrap yarn to make winter hats for the elementary school recess box. I have enough to make four more hats, and then all of the scrap yarn will be used. 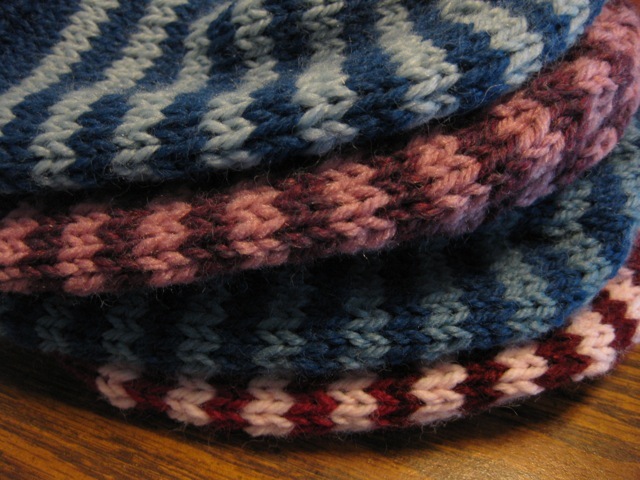 These simple hats make great television knitting. 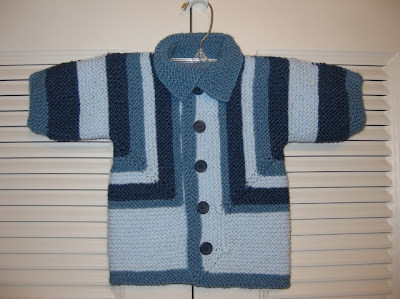 Rena's yarn enabled me to knit numerous items for charity: seven Baby Surprise Jackets, at least eight hats, and six squares to be added to other squares to make a blanket. Remember jumping rope during recess? I do, and I loved it. Yet, when I saw this video I was in complete awe of the skills and athleticism of these young women. This video is a performance during half-time of a Naval Academy game, and this skilled group is called the Kings Firecrackers. 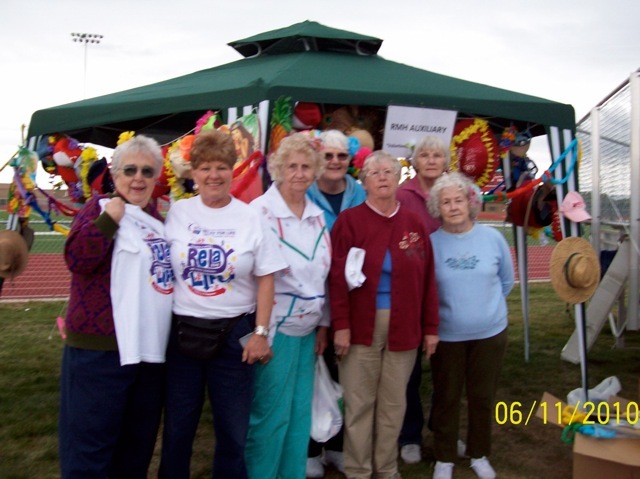 This afternoon several members of the hospital auxiliary met at the high school track to decorate the group's shelter for the annual Relay for Life walk. Our group will be wearing team shirts, leis, and flowers in our hair. 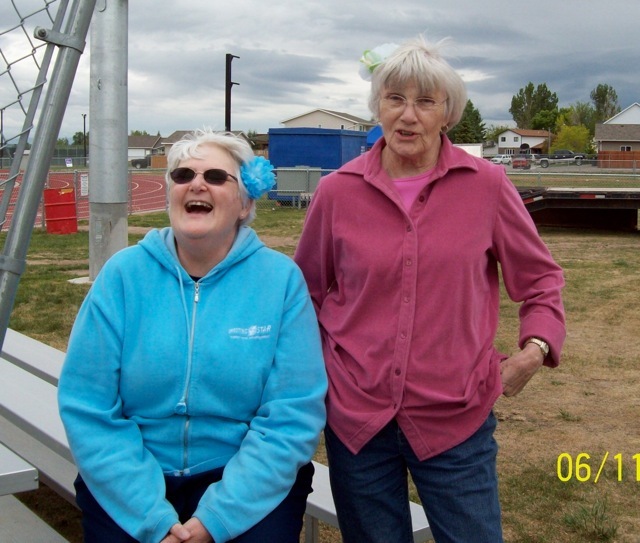 Carolyn and I shared a laugh as we decided which side of our head we would wear the flowers. It is going to be a cold, rainy evening and the showers will continue into mid-day on Saturday. My assigned walk time is 6:30 - 7:30 AM on Saturday. 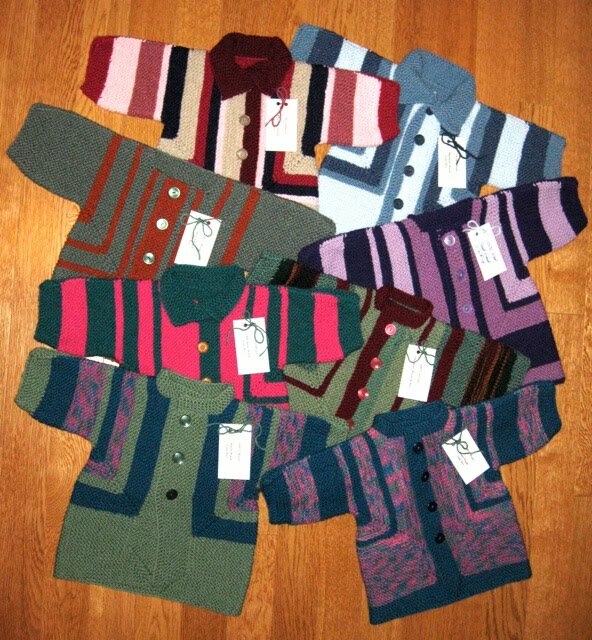 I am going to wear my fleece parka, mittens, and hat. I am also taking a rain poncho and an umbrella for insurance. This little jacket gave me fits. It is loaded with "design elements" that I did not want to frog - again. 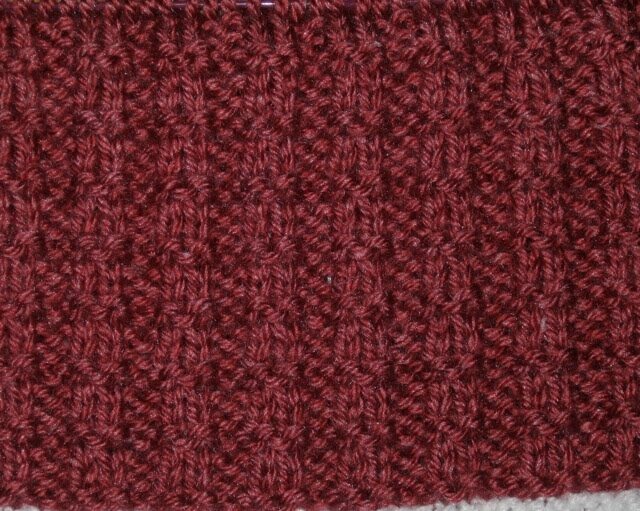 Even though, I have enough scrap yarn for another BSJ, I think it is time to stop for awhile and allow my needles and my patience to rest. "The dog ate my. 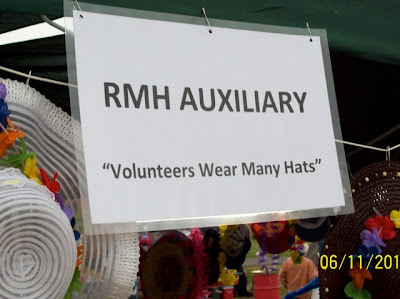 . ."
I wish I could remember how many times I actually heard that statement from one of my students. It was usually uttered by someone who haven't attempted or finished their homework, but now I wonder if some of them could have been telling the truth. 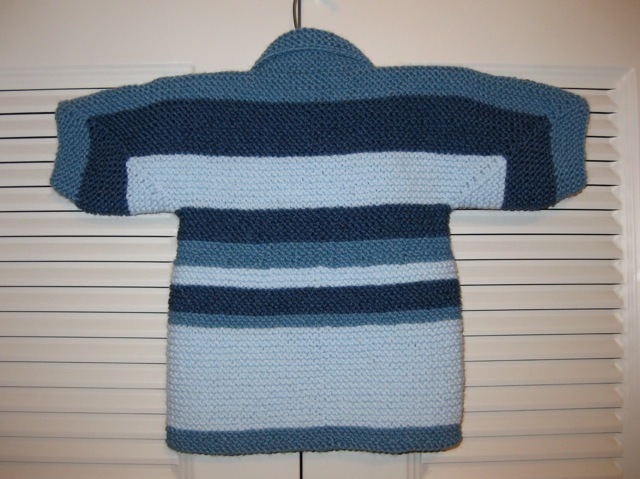 It was one of my knitting buddies that changed my mind. 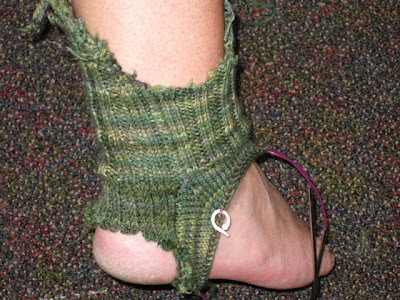 You see, her dog actually ate . .
And not just any sock, but the first attempt at knitting a sock. She took the class with me about three years ago, but she never got the hang of it. I told her to find her sock and we would work on it together. 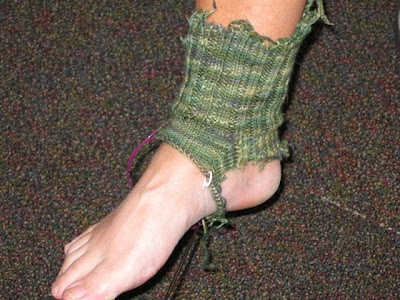 She had just finished the gusset and was ready to cruise when her dog chewed the top of the cuff and totally gnawed the heel. 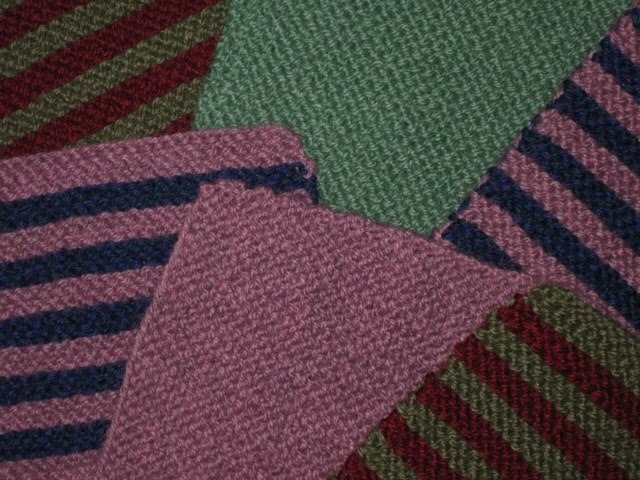 She was left with an air-conditioned wool sock. 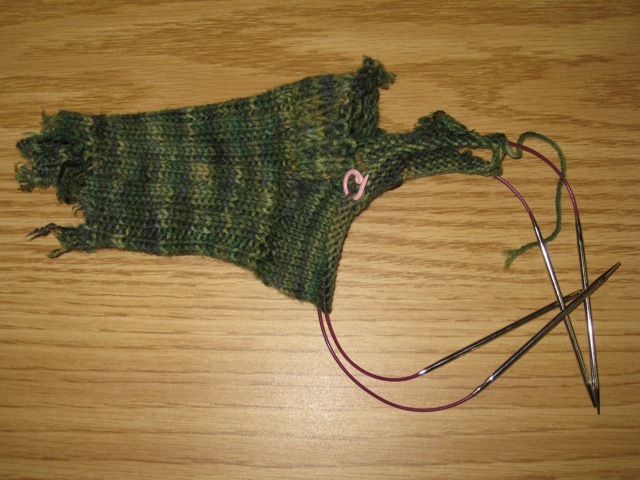 Thankfully, the dog spared her needles and most of the remaining yarn, so she may be able to knit a pair of short-cuffed socks. I have gained a new respect for the statement, "the dog ate my homework." Look what I found last week! 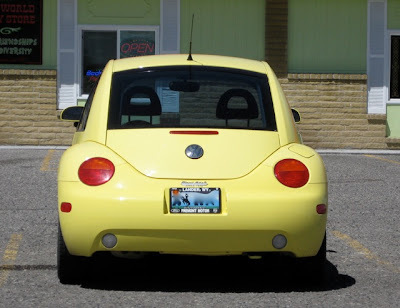 My luck has changed: I finally found a yellow, smiling VW in a local parking lot. The black headrests make it difficult to see the "eyes." The white headrests on the blue one found in Colorado are more visible. Now, I am hunting for a Cherry Red VW bug. Rena's yarn supplied another baby sweater: BSJ #7, finished on Saturday. 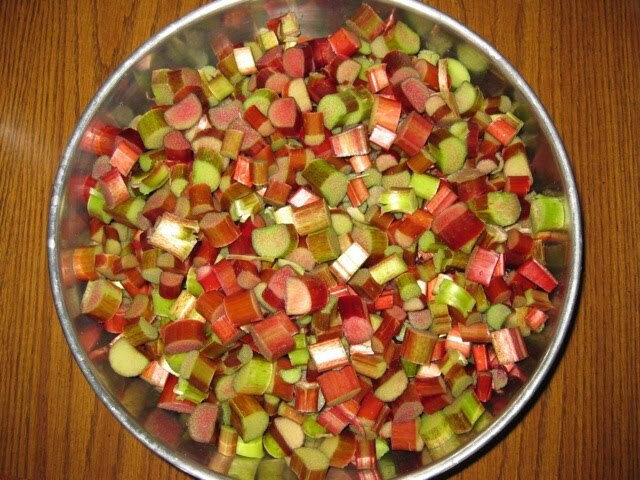 This morning I pulled rhubarb (the first of the season) and prepared it for the freezer. It seemed to take me forever to cut the stalks. This first pull was a good one with a variety of stalk sizes. 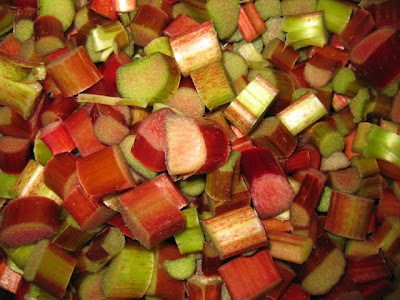 I grew up eating rhubarb, as my mother had almost 10 hills. Those hills produced a bounty that she shared with several neighbors. I smile remembering how she grabbed the butcher knife and a paper grocery bag as she saw the visitors out to their car. No one left empty handed. Rhubarb pie is a favorite of Marilyn's husband, and I enjoy making it for him. Marilyn asked me to bring some rhubarb on my last visit, but the hills were just beginning to form. When I see her again in July, I will definitely have some rhubarb for her. 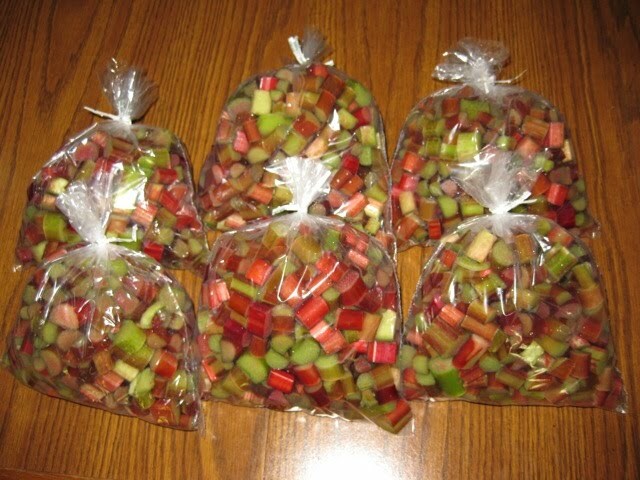 This morning, I bagged 4 cups of rhubarb in each bag, just enough for a pie. Place rhubarb in an unbaked pastry shell. Mix eggs, milk, sugar, and flour in a small bowl. Pour the mixture evenly over the rhubarb (it will seep through the crevices). Dot the top with the butter. Arrange another pastry shell over the top of the rhubarb, and cut holes to allow the pie to vent while baking. Lightly sugar the top shell, if desired. Bake 40 - 45 minutes in a preheated 400 degree oven. (Place a cookie sheet or foil under the baking pie because sometimes it will bubble over.) Enjoy! 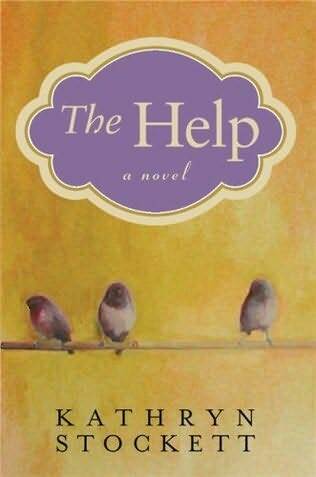 No doubt you have heard about The Help by Kathryn Stockett, but if you haven't read it yet, you really must. I couldn't help but envision Miss Skeeter (one of the narrators) as a grown-up Scott from To Kill a Mockingbird by Harper Lee. Skeeter (Eugenia) and Scout (Jean Louise) have a great deal in common: both grew up in the deep South, both loved their black housekeeper, both discovered prejudice is carefully taught, and both fought to cross the line of what society expects and what is morally right. 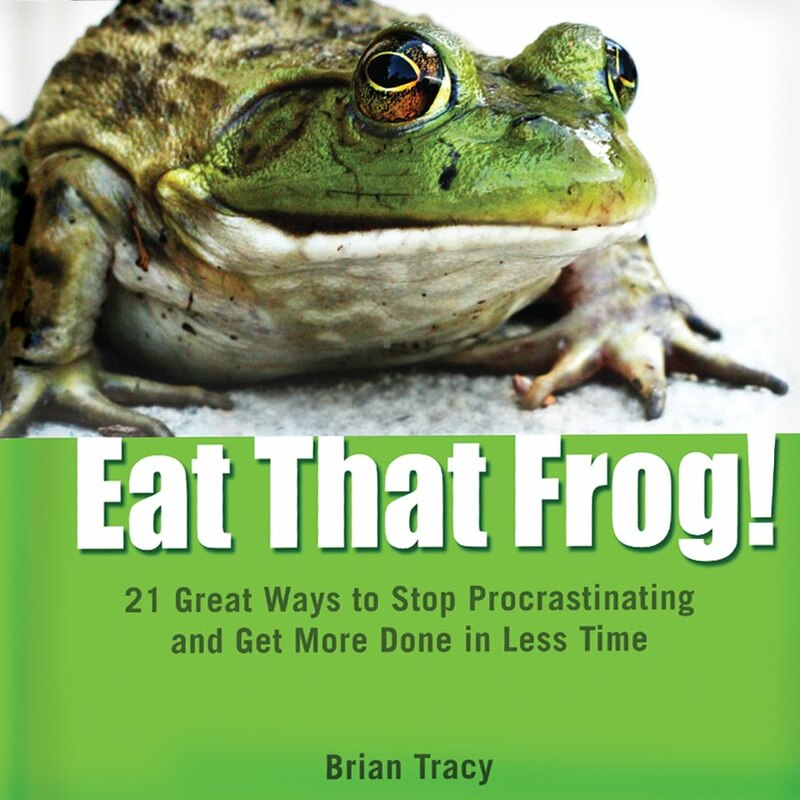 I finished reading this book in record time with a desire for more. I sincerely hope that Ms. Stockett writes another book.